Scenic Cityscape Printed Shark bite Top is rated 5.0 out of 5 by 1. 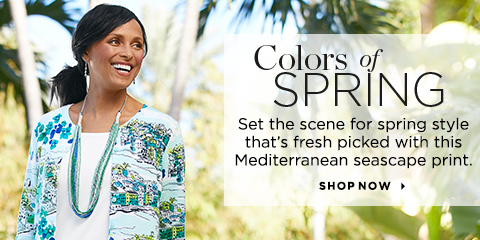 A sharkbite hem and detailed floral and seaside town pattern add a lovely, vacation-ready look to this printed top, while soft stretch fabric promises a fantastic fit. Rated 5 out of 5 by Hoog from Love the color I love the color of this top, it instantly caught my eye. It fits so well and is so comfortable. I only wish that I had been able to find the same color teal pants that would match.